We went to St. Joseph, Missouri, with no preconceived notions. Neither Micah nor I knew anything about the city, and what we uncovered during our long weekend visit, was a city full of surprises. We found hidden gems around every corner. Delicious restaurants, adorable boutique shops, cozy and quirky bars, historic architecture and beautiful nature are the norm for the quirky town of St. Joseph, Missouri. Our weekend started off with a walk around the historic downtown of St. Joseph. We moseyed along the streets and took in giant murals on the buildings and a wide array of sculptures on the sculpture walk that runs through the downtown streets. Eventually, we made our way into the Pony Espresso for a quick caffeine fix, before heading to our bed and breakfast, The Whiskey Mansion. Walking inside the bed in breakfast left us in awe—the house has been restored to its former glory and the details and decor are spot on with the late 1800’s period when the house was originally built. We would be spending the weekend in “the nursery”, and we settled into our cozy room in a heartbeat. Before heading to dinner, we ventured over to Krug Park for some fresh air with a walk to explore the waterfall and watch the ducks swim in the pond. Then, when we worked up an appetite, we went to Il Lazzarone Pizzeria for dinner. They use only the freshest ingredients and follow the law of traditional Neapolitan wood-fired pizza. Il Lazzarone is one of only 77 locations in the entire United States to receive the official certification, so you know you are in for a treat. We tried both the Carne and the Siciliano pizzas; they were fantastic and cooked to perfection. After dinner, we decided to pop over to Kris & Kate’s Ice Cream Treats for some ice cream and a bit of 1950’s nostalgic charm. One of the best parts of staying at a Bed and Breakfast, is the breakfast, so we definitely started off the next morning right. We sat in the beautifully decorated dining room and ate a delicious breakfast while chatting with the other guests. This would become our morning routine over the next couple of days, and it was a wonderful way to start each day. For our first day exploring St. Joseph, we met up with local business owner, Brian Myers, who is the co-owner of the Tiger’s Den and The Lucky Tiger. He spent the day showing us the ropes and sharing all sorts of interesting tidbits about the history of the city. Our first stop was Mokaska Coffee Company, a small batch roaster, for a cup of coffee. Then it was time to get outside and soak up some of the sun that started to peek through the clouds. We drove out to the Sunbridge Hills Conservation Area and went on a short hike along the bluffs of the Missouri River. The views from the overlooks gave us a peek at the Missouri River and Kansas on the other side of the water. Next up was the Remington Nature Center where we were greeted by a giant replica of a 10,000-year-old woolly mammoth. We learned all about the history, nature and wildlife in the Missouri River Valley, and we even arrived in time to catch the feeding of the Missouri River fish in the 7,000 gallon aquarium. After visiting the nature center, we drove along part of the St. Joseph Parkway which winds 26 miles through the city and is perfect for both hiking and biking. We also made our way back to the historic district of St. Joseph to ogle at all of the beautiful historic homes in the city, and wow, are there a lot of them! Lunch was sandwiches and to die for cheesecake made from a 100-year-old recipe at Magoon’s Famous Delicatessen. Magoon’s is a delicatessen by day and a live music venue by night. Inside, you will find walls full of trinkets from decades past and a whole lot of character that you can’t find just anywhere. Mount Mora Cemetery was our next stop that afternoon. This cemetery was established in 1851 and it is the oldest cemetery in St. Joseph. It is also listed in the National Register of Historic Places. If you visit, be sure to check out “Mausoleum Row” near the entrance for more than 20 impressive burial tombs. A little shopping was in order for the remainder of the afternoon, and for that, we ventured back to the Historic Downtown of St. Joseph. We browsed several adorable shops; some of our favorites included The Lucky Tiger, Nesting Goods, and Mod Podge Boutique & Design Studio. For dinner, we had reservations at the fine dining J.C. Wyatt House. This historic mansion was built in 1891 and has since been restored to all of its former glory and Victorian ambiance. Our meal consisted of an appetizer sampler with salad, soup and flatbread pizza, and for our mains, Micah ordered the filet mignon and I picked the roasted salmon. And, even though we were stuffed by this point, an irresistible dessert trio was served next. We thoroughly enjoyed the experience; a fantastic meal in a beautiful setting. A nightcap was necessary to end the evening, so we made our way down to Tiger’s Den, which is a cozy bookstore and bar located right downtown. All of the books inside the bar are for sale, and the cocktails, which are creative and delicious, by the way, are named after famous authors. We’d definitely become regulars here if we lived in St. Joseph! The third day of our visit was all about museums. We hit up 5+ museums, but honestly, we could have dedicated several days to fully explore them all. Fun fact: St. Joseph has more museums per capita than Washington D.C.—I never would have guessed that! The Patee House Museum was our first stop of the day. 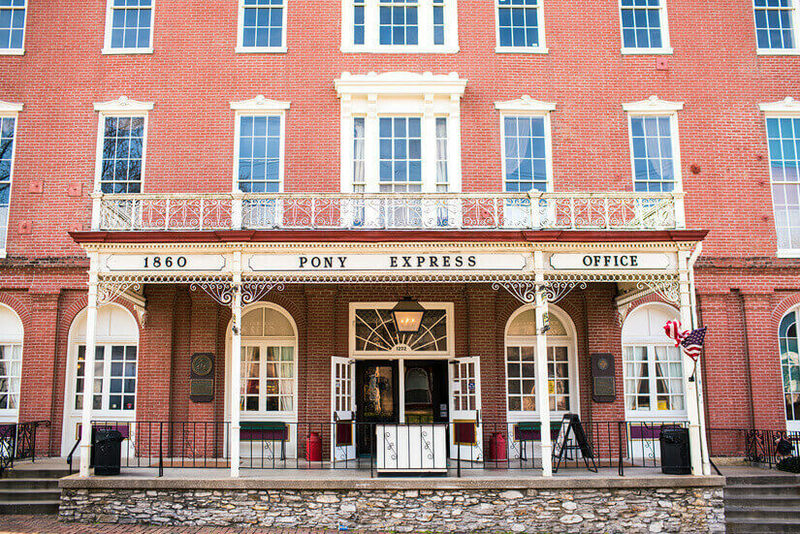 This museum was originally a luxury hotel built in 1858, and it was also home to the headquarters of the Pony Express! Today, you can find a replica of what St. Joseph would have looked like in the olden days, the Pony Express headquarters, and so much more. Located at the same complex as the Patee House, the Jesse James Home is another historical site worth visiting. The house where Jesse James was shot and killed was moved to this property and is now a museum. You can see the bullet hole from the shot that was fired at Jesse James, and you can learn all about the famous outlaw’s life. Because the Pony Express started in St. Joseph, Missouri, you can also find an entire museum dedicated to the subject. The Pony Express Museum is located in the stable building that housed the horses back in the day! Inside the museum, you will learn about the history of the Pony Express, what life was like for riders and stories about their lives. To switch things up a bit, our next museum was the Albrecht-Kemper Museum of Art. This museum is located inside the former home of Mr. and Mrs. William Albrecht. With an added-on expansion to the house, the museum is now home to a wide range of 18th through 21st century American art. Also, be sure to head downstairs to take a peek at Mr. Albrecht’s library and hidden Speakeasy in the basement of the home. The last museum on our itinerary for the day was the St. Josephs Museum Complex. This complex is home to 4 different museums: The Glore Psychiatric Museum, Black Archives Museum, The St. Joseph Museum and the Doll Museum. All of these museums are housed in the same complex and you can access them all with one admission ticket. Once again, we could have spent the better part of a day inside this museum alone—there is just so much fascinating information to take in! All of that museum hopping certainly made us hungry, so midway through the day, we made a pit stop at a Louisiana style eatery, Boudreaux’s, for a delicious lunch of chicken fried chicken, crab bisque, and bar trash, aka blacked shrimp and lump crabmeat served as an appetizer. Dinner that evening was at the original Galvin’s Dinner House. We ordered the family style pan fried chicken which comes with sides of mashed potatoes, gravy, sweet creamy corn and green beans. It was quite the feast! After dinner we made our way to the amphitheater at Krug Park to catch the Spring Fire Fling show. It was an hour-long show packed with twirling fire, great music and lots of energy. To finish off the evening, we headed back to downtown St. Joseph, and popped into the bar at Ostrea for an innovative cocktail before capping off the evening at Club Geek. Club Geek provides a cozy atmosphere complete with board games, new and old school gaming systems, and practically any game you can think of. As we sipped on our beers, we challenged each other to a game of Dr. Mario on an original Nintendo console. By the end of the weekend, The Whiskey Mansion began to feel like home. Our morning talks with the other guests at breakfast, our computer work sessions on the dining room table, and retiring to our cozy bedroom in the evenings really made it feel like we lived in this beautiful home, if only for a weekend. We weren’t quite ready to leave on Sunday morning, but the road was calling our names. We made one last quick stop at Gold N Glaze for fresh donuts and waved goodbye to the town of St. Joseph in our rearview mirror. Have you ever been to Missouri? We visited St. Joseph, Missouri, as part of a content creation project. Special thanks to St. Joesph, Missouri, and Madden Media for hosting us on our adventures. As always, all opinions are our own. Thanks, this is a lovely article and I will be sharing the heck out of it. This is my lifelong hometown and I have been to most of those places repeatedly. It is great to see them through someone else’s eyes and get a reminder of how great this place really is. This is my hometown and your post makes me proud. I have been away now for 20 or so yrs ( except for visits) and now I’m really homesick!! Lol. Glad you enjoyed your visit! Thanks, Sharron–so happy to hear that! It’s always so hard to be away from home, isn’t it!? Hope you can go back for a visit sometime. We had a great time exploring! You missed the new River Bluffs Brewery and Friedrichs Market. We visited last spring so the brewery wasn’t open when we were there. Friedrichs Market would have been fun to check out too but unfortunately we didn’t have enough time to squeeze it into our schedule. Hopefully next time!